The anti-privatisation campaign at the University of Sussex is gathering strength - and there are signs university management are feeling the pressure. 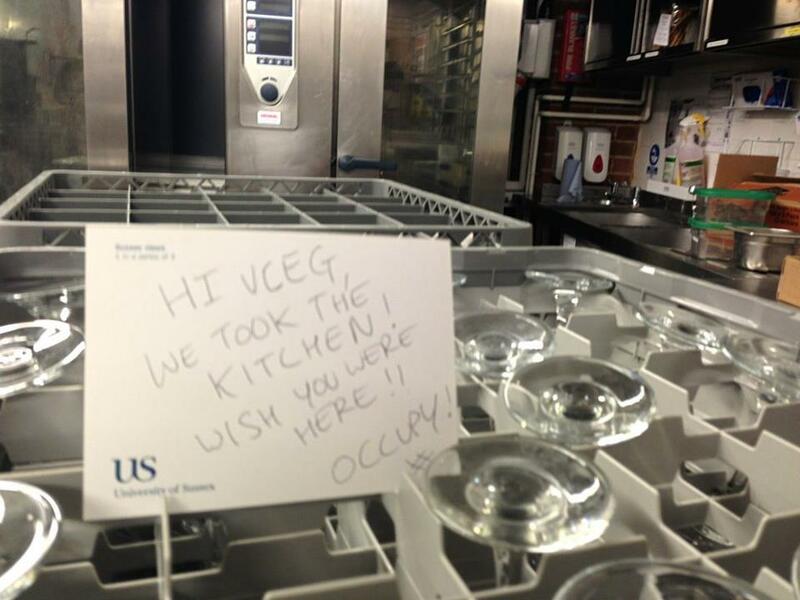 The student-led occupation of the Bramber House conference centre is now 6 weeks old. Monday 25th March has been called as a national demonstration against the privatisation and marketisation of universities. At the time of writing, nearly 900 people are 'attending' the Facebook event, while free coaches are being laid on from London. In the build-up to Monday's mass demonstration, management have attempted to clamp down. On Tuesday evening, private security hired by university management attempted to impose a checkpoint to conduct bag searches and student ID checks on the occupation. This led to an academic speaker being denied entrance. The occupiers, in line with their policy of "peaceful non-compliance" resisted. One occupier was grabbed by the neck and thrown to the floor, but student reinforcements arrived and security withdrew. The established arrangements of open access between 8am and 10pm were preserved. 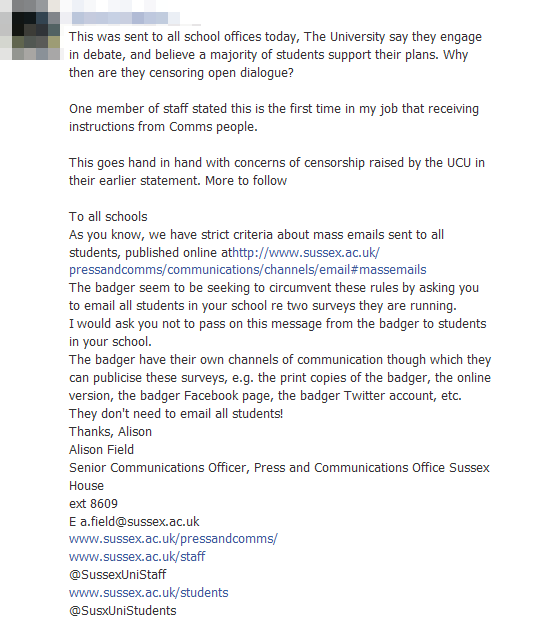 On the same day, the university's senior communications officer sent an email to all schools claiming that a survey on attitudes to privatisation being conducted by student paper the Badger was in breach of university rules, and urging staff not to co-operate. This was understood by students as clear contempt for freedom of the press. 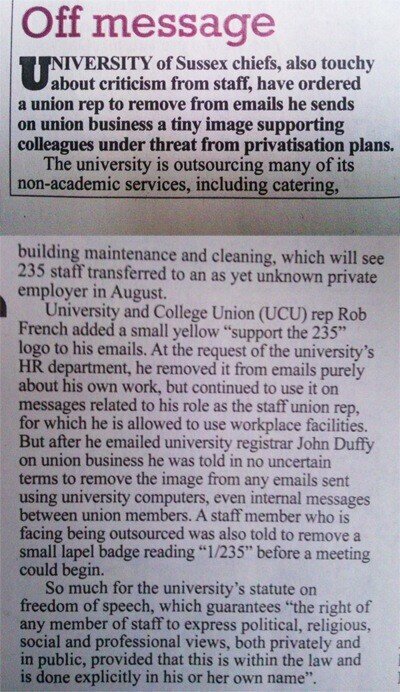 It has also been reported that a student who wrote a letter of complaint to management has been fined £100. The fine was subsequently commuted to a mandatory seminar on the “ethical lines relating to the boundaries of ‘fair comment’ in polemical communications”. The student's offending remarks were reported to be suggesting that a manager's job title should be “director of corporate tyranny and human suffering”. Meanwhile, academics and support staff from the departments of anthropology and international relations have written statements of support, while a local MP has tabled an early day motion in parliament. The national demonstration is scheduled for 1pm, Monday 25th March, Library Square, University of Sussex, Falmer. Incensed at an “abusive email” from a student suggesting that Sussex University managers are ruthlessly focussed on making money, the said managers decided to fine the student £100. The controversy – in which someone emailed a Big Manager On Campus (‘BMOC’) to suggest, “Perhaps an apt job title for you would be Director of Corporate Tyranny and Human Suffering,” – came at the end of a week which saw a Palestinian court hand a man a one-year prison sentence for insulting Palestinian Authority president Mahmoud Abbas, and a European Court of Human Rights ruling which found that France had violated an activist’s freedom of expression by fining him for showing an abusive placard to Nicolas Sarkozy. So as a ballpark figure, it's cost them £90,000 so far. Which isn't even half the VC's salary (£225k ish), but ain't peanuts. Escalate escalate escalate. Promising stuff, thanks for the updates and solidarity! Fire safety officers just came and looked around the Occupation after reports from 'an anonymous source' that students had glued locks, covered fire alarms and smoke detectors, barricaded doors and burnt the place. After checking the space, they declared it safe. In fact, the fire officers were rather annoyed that their time had been wasted. Once again it feels great to have the moral high ground. It is believed that whoever made the false report was hoping that we would not let the fire officers in and they would then issue a prohibition order, making the occupation illegal. The opposite happened; we have their blessing and have exchanged contact info, so we can liase on fire safety. NATIONAL STUDENT DEMO-SUSSEX from roxanna on Vimeo. Interesting link between [Sussex VC Michael] Farthing and Sodexo - in 2010 Farthing became the non-executive director of the Brighton and Sussex University Hospitals NHS Trust, of which Royal Sussex County Hospital is part, and the choice for catering and cleaning outsourcing at both the hospital and Sussex is Sodexo. As a member of the trust's Safety and Quality committee, it's not much of a stretch to assume he had some say in assessing the quality of Sodexo's service. Anyone else have the words 'corporation kickback' come to mind after reading this? Also on the incompetent clampdown front, private security tried to refuse access to parents with kids. This is one ten year-old's account, while apparently they also told people they were "bad parents" and threatened to call social services. Latest: management have closed the meeting house - a popular hub for union/political meetings - due to 'flooding'. Staff and students say there's no flooding, just management shutting down meeting spaces. Apparenty management have also now removed the shower heads from the showers the occupiers have been using (link). It's all dirty tricks and petty autocracy around here. This is one of the posters produced for the protest..
135,000 / 40 / 7 = 482 conference attendees per week. That seems on the high end of plausible, but possible. 80,000 / (7 x 7) = £1,632/day on security. As that's 8 people on 12 hour shifts making about £100/day, that sounds about right, with the agency taking double the security's take-home pay. Which remarkably means the occupation has cost management £225,000, which iirc is exactly VC Farthing's salary.